A young blind woman is snatched from her home and transported to a primitive world of magic and capricious gods where she's transformed into a Seer; a golden-eyed being with awe-inspiring powers. Now all she has to do is learn to wield them... and save those she loves from the ho... read full description below. 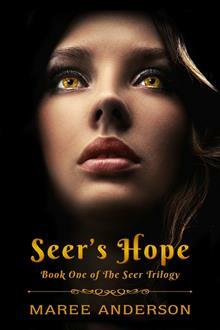 Hope is snatched from her home and transported to a primitive world of magic and capricious gods. The Dayamari people believe she's a Seer and their only hope of salvation, but she's blind - she can't see anything at all, let alone the future. She must accept her destiny and learn to wield the awe-inspiring powers the gods have bestowed upon her. And if she's to save those she loves from the horrifying evil that lurks in the darkness, failure is not an option. Maree Anderson writes paranormal romance, fantasy, and young adult books. She lives in beautiful New Zealand, home of hobbits, elves, and kiwis-both the fruit and the two-legged flightless variety. Her first novel for young adults, the multi-award-winning Freaks of Greenfield High, was optioned for TV, and currently has over 2 million reads on Wattpad. Alas, Freaks didn't make it to the small screen, but it sure was a fun ride while it lasted. Readers will be pleased to know she is definitely planning to write more books in her popular Freaks and Crystal Warriors series.